Sometimes it’s the stories you hear of complete strangers dying that really hits home. This one about a Minnesota family is tragic to say the least. It involves a family of five who were driving in their minivan to Denver, so the husband and wife team of Jamison and Kathryne Pals, both 29, could get some training for a mission trip they were planning to take to Japan. This multi-car accident occurred just over the Colorado border with Nebraska. It occurred on Sunday, July 31 on Interstate 80 near Ogallala, NE. A trailer truck rear-ended the back of the Pals’ minivan. The Pals along with their three children were all killed in the crash. The Pals family was journeying to Colorado to attend a training called Mission Training International, where they would have received the final four-week preparation training needed to go to Japan. A 56-year-old Denver man was also killed in the crash. Four vehicles in all were involved in the collision. The 53-year-old semi-truck driver was arrested and charged with five counts of felony motor vehicle homicide and one count of reckless driving. How Do Truck Carriers Protect Against Fatal Crashes? All commercial truckers that operate as interstate carriers are required by law to carry liability insurance that covers up to $750,000 in damage or injury to another person and their personal property and vehicle. If the compensation damages being sought is higher in value than what the policy carries, then an attorney can go after that truck driver’s personal wages and savings. If you have been injured in a truck accident, it’s time to contact a trusted Littleton Truck Accident Attorney at Bahr, Kreidle & Flicker. Since 1983, our attorneys have been fighting on behalf of people injured in truck and motor vehicle accidents. 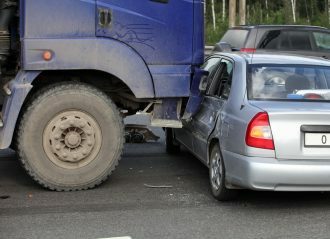 Our Little truck accident attorneys aggressive pursue your justice and seek to get you the court-ordered award or settlement that you may deserve. To set up a free, initial consultation on how we can best serve you, call us at (303) 794-7422 or email us using the contact form on this page. 1“6 Dead, Including Family of 5, After Multi-Car Crash” published in 9 News, August 2016.